April and May can be some pretty great months to visit Belize. The Spring Break rush has started to thin out. The peak airline prices of December and US Presidents’ Week are starting to come down a bit. And the wetter season hasn’t started yet so the average day is rain-free and warm. On the mainland it can be very warm…but let me tell you some of the reasons that the trip will be well worth it. All the usual every day Belize stuff is going on…snorkeling the reef, beach barbecues, food tours, diving, spotting manatees, visiting stunning Mayan ruins, bird watching, cave tubing and zip lining and more. Not enough? Here are some special events you can add to your itinerary in April and May. The largest fish in the sea can be seen feeding on snapper spawn off the coast of Belize during the full moons in April and May. A few days before and a few days after these moons, the sharks migrate to this area to eat. It’s what they do…it’s what they live for. It can’t be easy to maintain a weight of 20 tons eating plankton and fish eggs. AND YOU CAN SWIM WITH THEM…or at least try to keep up. 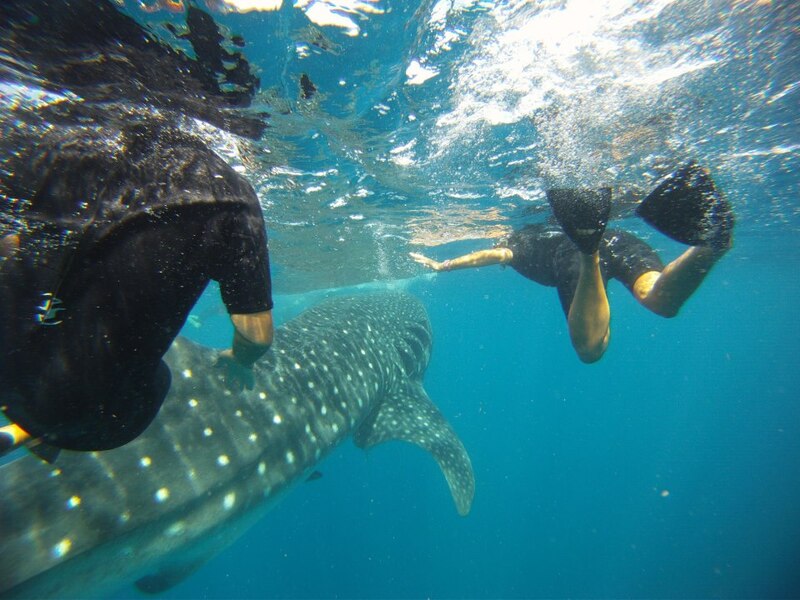 I saw these HUGE sharks last year off the coast of Isla Holbox, Mexico (that’s me on the right) and trust me, it is the most awesome experience. Ever. Benque, in Western Belize, covers the streets in colored sawdust artwork for the holy procession to the church in the evening.Easter is both the highest holiday on the Christian calendar and the biggest party weekend of the year- when Belizeans all head to the beach. It’s really interesting how Belize tries to maintain both “traditions”. Good Friday is the holiest day – there is no alcohol served (at stores or in bars) around the country – including the international airport. Benque, in western Belize, covers the streets in colored artwork for the holy procession in the evening. It’s quite beautiful. On Ambergris Caye, it is a quiet day – with a procession in the evening. Last year, there was decorating around the statue by the Roman Catholic Church. Crowded? Check. Crazy crowded. Approximately 20,000 people attend this event. Fun? Check. 100 checks. This event should not be missed…actually that is not true. Everyone should go once. 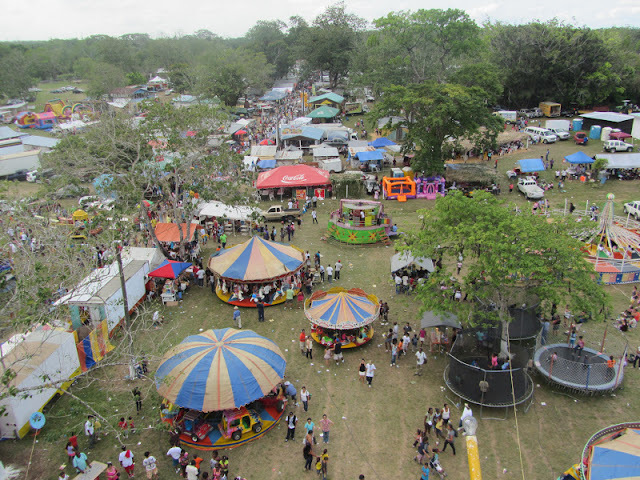 Food, drink, dancing, games, carnival rides, animals, plant and fruit shows, a rodeo, live music and everyone you know in Belize…I haven’t even scratched the surface. Check out my two parter on the 2014 Ag Show. (Part One and Part Two). And I’ll definitely see you there! Here’s how you can check them out on Facebook for more information. Just take a look at the inner workings of the giant ferris wheel! If that’s not exciting, I don’t know what is. May 24th to May 26th. Over a long, holiday weekend in Belize (Commonwealth Day), this festival celebrates the chocolate industry in Belize. See how chocolate is grown, harvested and made. Eat the chocolates of Belize from all over the country like one I love Belize Chocolate Company’s dark chocolate with chili. Slather on some of their chocolate body butter. I had so much fun at the Street Fair in 2014. Punta Gorda is a REALLY special town. Even taste the Belikin Chocolate Stout. Follow the festival on Facebook for more information. Looks like I am going to have a very busy few months. Think you can get 2 months off of work? Put the beginning of June on your calendar too – the MANGO FESTIVAL in Hopkins is SO great. Last year I had the best stay there for the event. And then you can also go see the BURNING WATER! The bioluminesce JUST outside of Hopkins is fantastic. And then…June brings lobster season and the huge lobsterfest bashes around Belize. Stay tuned. There is always something going on. And…if you like…you can share it on Pinterest. In case you can’t get here until 2020. I’ll be arriving with my family on May 28th for a 3 week stay, planned mostly to veg. in Caye Caulker. Sure wish I was arriving a few days earlier for the chocolate fest! Oh well, look forward to seeing if I will be able to catch any others while I’m there. Can’t wait! Trust me…there will be plenty to do. You’ll love it. My wife Jules and I are taking a trip to San Pedro next week Tues 23rd, we have a cunning plan to pack all our things into storage next year in California and move to San Pedro to live:) Your blog has been so helpful to us! Our 5 day vacation, apart from being a well earned break is also going to be a scouting trip, looking for potential places to rent, and getting as much info from locals and ex pats as we can so we can be prepaired for our move. No doubt we will be frequenting the many bars that you have written about, maybe we’ll see you about!